A woman falsely accusing Alabama Republican U.S. Senate candidate Roy Moore of impregnating her at 15 years old approached The Washington Post with her story in what appeared to be a sting effort to deceive the news organization. The woman, Jaime T. Phillips, appears to work with Project Veritas, an organization that attempts to secretly record deceptive conversations with journalists in an effort to discredit mainstream news outlets and expose what they claim to be media bias. The Post interviewed her over the course of two weeks, identifying falsehoods and inconsistencies in her story along the way. In her unsubstantiated story, she claimed to have a sexual relationship with Moore as a 15-year-old, which she claimed led to an abortion. In the interviews, Phillips would ask reporters for their opinions on how her false story, if made public, could affect the Moore campaign. Ultimately, The Post did not publish her story, and Phillips insists that she is not connected to any larger organization. One reporter confronted her on the alleged deception, also noting a suspicious internet post made by Phillips. Monday morning, Post reporters saw Phillips walk into the offices of Project Veritas. The organization's founder James O'Keefe declined to answer any of The Post's questions about the encounter with Phillips or her employment at Project Veritas when confronted outside of the organization's office. "I am not doing an interview right now, so I'm not going to say a word," O'Keefe told The Post. He declined to comment on Phillips' employment with Project Veritas in follow-up interviews with The Post. He also refused to clarify whether he was working with Moore, former White House strategist Steve Bannon or other GOP strategists, according to The Post. Both Phillips and a spokesman for the Moore campaign have yet to respond to inquiries from The Post. Once Phillips was spotted outside Project Veritas' office, The Post decided to publish her previously off-the-record comments. "We always honor 'off-the-record' agreements when they're entered into in good faith," said executive editor Martin Baron. "But this so-called off-the-record conversation was the essence of a scheme to deceive and embarrass us. The intent by Project Veritas clearly was to publicize the conversation if we fell for the trap. Because of our customary journalistic rigor, we weren't fooled, and we can't honor an 'off-the-record' agreement that was solicited in maliciously bad faith." A tip from an account with the name "Lindsay James" came to Post reporter Beth Reinhard, who wrote the original story shedding light on sexual misconduct of minors claims against him. "Roy Moore in Alabama ... I might know something but I need to keep myself safe," she wrote. "How do we do this?" Reinhard asked if the individual was willing to speak off the record. "Not sure if I trust the phone," they replied. "Can we just stick to email?" "I need to be confident that you can protect me before I will tell all," they followed up in another email, according to The Post. "I have stuff I've been hiding for a long time but maybe it should stay that way." Reinhard and the individual began to speak over Signal, an encrypted text messaging service, according to The Post, eventually speaking over the phone. The account name "Lindsay James" revealed herself to be Phillips. Reinhard and Phillips agreed to meet at a shopping mall in Tysons Corner, Virginia, just outside of Washington, D.C.
"I'm planning to do some shopping there so I'll find a good place to meet before you get there," Phillips wrote, insisting the Reinhard come alone. 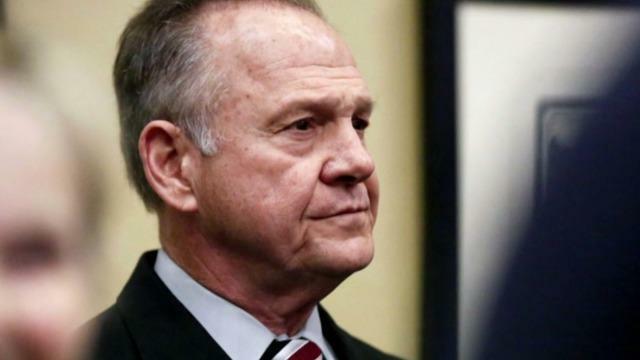 In the meeting, Reinhard provided what appears to be a fabricated story regarding her childhood in Alabama, her "secret" sexual relationship with Moore, and the subsequent fictitious pregnancy. As part of her story, Phillips claimed that Moore convinced her to terminate the pregnancy. She asked Reinhard multiple times to promise that her story would help Moore lose the election, according to The Post. Reinhard responded that she could not predict such an outcome, adding that her claims must be fact-checked and corroborated. Phillips wrote that she was no longer certain about coming forward. "I'm so sorry but I want to be straight with you about the fact-checking process and the fact that we can't guarantee what will happen as a result of another story," Reinhard wrote. Later Phillips suggested another meeting with a second Post reporter, Stephanie McCrummen, a co-writer on the original Moore accusation story. Meanwhile, Reinhard discovered inconsistencies in her story. Phillips claimed she lived in Alabama one summer as a teenager, but her cellphone number had an Alabama area code. Reinhard also called Phillips' employer, or so she claimed, and the company could not identify her as an employee. Then, a Post researcher discovered a GoFundMe fundraising campaign page under the name Jaime Phillips. "I'm moving to New York!" the internet post reads. "I've accepted a job to work in the conservative media movement to combat the lies and deceipt [sic] of the liberal MSM. I'll be using my skills as a researcher and fact-checker to help our movement. I was laid off from my mortgage job a few months ago and came across the opportunity to change my career path." Project Veritas also posted on its Facebook page in March that it was looking for 12 "undercover reporters" which they described on their website as a job "... not for the faint of heart" because it would require taking on "an alias persona, gain access to an identified person of interest and persuade that person to reveal information." McCrummen agreed to meet Phillips in Alexandria, Virginia, and brought along a printout of the GoFundMe page to her interview with Phillips. Post videographers sat at a table adjacent to the interview. Phillips didn't want to get into details of her alleged history with Moore, but insisted that McCrummen promise that her story would lead to Moore's Senate loss. "So my whole things is, like, I want him to be completely taken out of the race ..." she said. "And I really expected that was going to happen, and now it's not. So, I don't know what you think about that." McCrummen asked Phillips to see a form of identification and then confronted her with the GoFundMe page, The Post reported. "We have a process of doing background, checking backgrounds and this kind of thing, so I wanted to ask you about one thing," McCrummen said. "So I just wanted to ask you if you could explain this, and I also wanted to let you know, Jaime, that this is being recorded and video recorded." "Okay," Phillips responded. "Um, yeah, I was looking to take a job last summer in New York, but it fell through," she said. "Yeah, it was going to be with the Daily Caller, but it ended up falling through, so I wasn't able to do it." Phillips hesitantly said that "Kathy Johnson" from the Daily Caller interviewed her, but the Daily Caller's executive editor Paul Conner said that no one by that name works for the organization, nor was there any record of an interview with Phillips. Phillips told McCrummen that she was not affiliated with the Moore campaign and that she did not record their conversation. "I think I probably just want to cancel and not go through with it at this point," Phillips said, declining to answer any more questions and leaving. The original GoFundMe page has since been deleted and replaced.